On Wednesday, the FBI revealed that Enrique Marquez, the neighbor who legally purchased the assault rifles used in the San Bernardino shooting, was involved in planning an attack in 2012 with shooter Syed Farook. Marquez told investigators that part of the reason the two didn’t carry out their plans was that they were spooked by unrelated FBI arrests around that time of four people charged with attempting to travel abroad to carry out jihad. Marquez had bought guns for Farook that were among those used by Farook and his wife in the San Bernardino attacks last week. Officials caution that Marquez’s claim of a 2012 attack could turn out to be not true and an attempt to deflect his role in helping buy weapons that Farook later used in the San Bernardino attack. Marquez has told investigators he didn’t know about the plans for the San Bernardino shooting attack. He has not been charged with a crime. Authorities are still attempting to determine whether Marquez bought the guns for Farook in 2011 or 2012, or for himself. Either way, he could be charged, since the exchange of guns needs to be handled through a licensed dealer. The FBI also reported that Farook and his wife, Tashfeen Malik were radicalized separately—before they had even met. 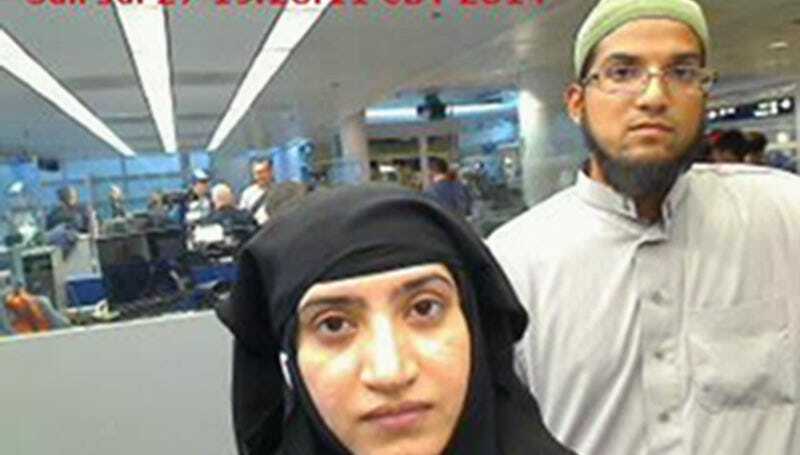 “They were actually radicalized before they started courting or dating each other online, and online as early as the end of 2013, they were talking to each other about jihad and martyrdom before they became engaged and then married and lived together in the United States,” said FBI Director James Comey this afternoon.